Peter Bosz claimed Manchester United’s unambitious tactics made for a dull game. 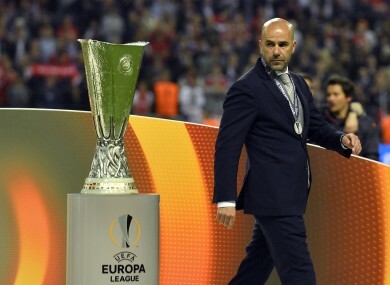 Ajax coach Peter Bosz walks past the trophy at the end of the Europa League final. AJAX COACH PETER Bosz said Manchester United’s unambitious tactics made for “a boring game” following his side’s 2-0 loss in Wednesday’s Europa League final in Stockholm. United won the trophy for the first time, courtesy of goals by Paul Pogba and Henrikh Mkhitaryan, despite seeing only 33 percent of possession at the Friends Arena and registering just four shots on target. “I’m disappointed because you play finals to win them. We didn’t,” Bosz told his post-match press conference. “I haven’t see the Ajax that I’m used to, which means good football, high pressing and being dominant. The game was overshadowed by Monday’s terror attack in Manchester, which left 22 dead and dozens injured, and Bosz admitted it had had an impact on the players from both teams. “Obviously both sides were affected,” said Bosz, the first coach to steer Ajax to a major European final since Louis van Gaal in 1996. Email “Ajax coach rues 'boring' Europa League final loss”. Feedback on “Ajax coach rues 'boring' Europa League final loss”.